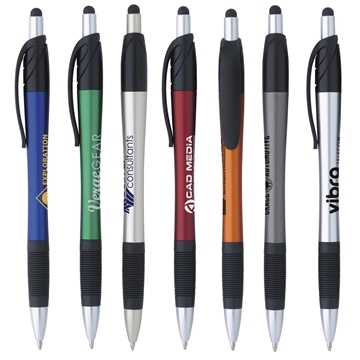 Sleek retractable ballpoint pen, with metallic barrel finish, and built in soft touch stylus. Ink Color/Point Style: Black ink medium point. We bought these as Staff Appreciation gifts for our teachers and support staff and received a lot of positive feedback from the staff members. We were pleased with the quality and the price! things went very well, so I believe I would look to AnyPromo for future orders first. I loved the color. It's very portable and non-descript. this product looked elegant and was very sturdy. We really liked the colors and clients loved them. We will continue to use ONLY AnyPromo because of the great products and Rosa giving crucial advice!